Over all the Jetson self-balancing scooter is the perfect choice for the fast phased music lover. Enjoy your favorite music while going at high speeds up to a maximum of 13 mph. The distance also speaks for the Jetson hoverboard and we can surely say this is a great self-balancing scooter and you do get your money’s worth. Safety, The safe Samsung battery and the overall superior quality should be enough to convince anyone to invest in a Jetson hoverboard. Speed, 13 mph is more than enough! Climb, It had no problem climbing and 23 degree hill with 140 lbs on it. Speakers & Bluetooth, the Bluetooth had a great 13 feet range and the speaker sound is flawless. Enjoy your favorite music with a fast self-balancing scooter with both Bluetooth and speakers. False Reviews, There are many false reviews on Amazon since they took down most of the other hoverboard suppliers products due to safety issues. I think they are just upset to miss out on sales going straight to this fantastic scooter. Do not trust all the fire accusations and other stupid things being said in the “unverified reviews”. The Jetson hoverboards we’re produced to give kids a chance to ride a slower and safer hoverboard. 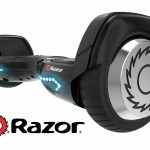 Unfortunately none of the Jetson hoverboards are still available for purchase at this time and we suggest that you check out our list of the most popular kids hoverboards. Due to Amazon taking down many of the other suppliers hoverboards there has been an increase in negative reviews on Jetson and the other “approved” self-balancing scooters. Do not lay your trust to these accusations since they are totally based upon lies and I personally do not think Jetson deserves this. They deserve to be raised because they covered all the regulations and safety issues and now are one of the few hoverboards left on Amazon. So, Jetson has finally entered the game and what an entrance they have made. When most hoverboards gets removed from Amazon Jetson comes on and is one of the few at the moment that has all the safety issues covered. The proper documentation, charger and battery quality. But the Jetson electric self-balancing scooter has more to add to the game then just its safety. Jetson’s third model is the 8 inch wheel, Bluetooth self-balancing scooter that has fantastic range and is easy to setup. It comes with a high quality Samsung battery that will power the scooter for up to 13 miles on a full charge. And what speed it has, when there are almost no hoverboards to be found this one blazes by in an incredible 13 mph. This scooter has put Jetson on the map and it is the far most superior self-balancing scooter yet. Even though it doesn’t have enough speed to put up against the our fastest reviewed hoverboard, the spaceboard. Even though this Jetson hoverboard has a little higher price tag they fully assure you that this device is safe and we felt the quality all the way through. We were so eager to get to try this one and it only took it 3 days to arrive. It comes with a UL charger and the battery is a 100% Samsung. The price might be a tad higher but let’s use that old cliché since it clearly fits this moment, you can’t put a price on safety! Our final notes about our test run is that it took us around 12.3 miles carrying 140 lbs. We topped at 13.8 mph which is a bit more than stated in their product specification. Everything went as smooth and there were no hiccups along the way. With the 8 inch wheels it took small potholes and other obstacles with ease. This was truly a sweet ride, it’s durable and water resistant so you can enjoy it even though it’s raining. 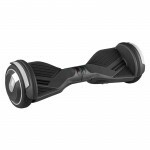 It’s the fastest hoverboard with bluetooth at this point and I do not see it getting beaten any day soon. It also have two lesser boards in its family, they both hold the same genuine quality the only difference is that they lack the Bluetooth/speaker feature and has lower distance/speed. You can check them out on here: 5 mph version / 8 mph version.